3) Disputes in which the parties have consented to DIFC Courts’ jurisdiction. (4) such other claims as may be ordered or directed by the Chief Justice to be heard by the SCT from time to time. (1) The fee for filing an employment claim shall be 2% of the value of the claim with a minimum fee of USD 100. (2) The fee for filing an appeal to the CFI following an employment claim in the SCT shall be 1% of the value of the claim with a minimum fee of USD 100. (1) The fee for filing all other claims shall be 5% of the value of the claim with a minimum fee of USD 100. (2) The fee for filing an appeal to the CFI following any other claim in the SCT shall be 2.5% of the value of the claim with a minimum fee of USD 100. (1) Applications seeking a fee waiver or suspension shall be free of charge. For a claim made by way of counterclaim, the same fee shall be payable as if the relief or remedy sought were the subject of separate proceedings. 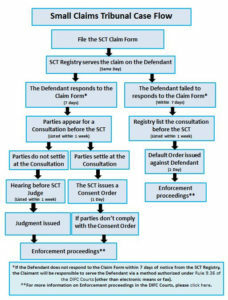 The SCT Registrar shall have the discretion to defer, reduce, or waive applicable fees in the SCT if the SCT Registrar, in his/her sole discretion, considers it appropriate in the circumstances.